The CMS 40s performed beyond my expectations for their size. Put them at the top of your list! Small and portable. Great build quality. Accurate non-fatiguing sound. Low end rolls off at 60Hz. 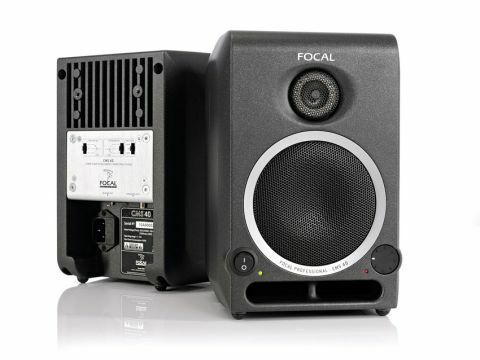 Focal Professional's CMS line is primarily designed for smaller studio environments for post-production work and (in the case of the CMS 40s) for use as secondary monitors to compliment larger full range systems. The CMS 40s are Focal's most compact nearfield monitors to date and on unpacking them, it's surprising how small they are, but how solid and well built they feel. They look the business too, with black-powder-coated, die-cast-aluminium cabinets. The speakers ship with removable protective grills, phase plugs (to insert over the tweeters for as precise a soundstage as possible), rubber feet, adjustable spikes and rubber isolation mats - plus they can be placed vertically or horizontally and wall mounted if required. Connection-wise, there's a kettle-plug power socket, a balanced XLR input and an unbalanced phono input. High and low-shelf EQ switches plus an input level switch are provided too for optimising the performance of the CMS 40s in your listening environment. Round the front, there's a power switch, overall volume control and a handy clipping indicator. The CMS 40s are a front-ported design (which is great if the speakers need to be placed close to a wall) and utilise a four-inch main woofer with Polyglass cone, coupled with a magnesium/aluminium inverted-dome tweeter connected to two separate 25W RMS, Class AB amplifiers. From these specs, it's clear to see that these are very much simply smaller versions of the larger CMS speakers and no corners have been cut in terms of materials, electronics or sound production. As fans of Focal's larger Twin 6 BEs, we were eager to try these monitors out and are happy to inform you that these tiny speakers have the fantastic accurate sound stage and overall character of their much more expensive CMS and S-Series brothers, which is great news, particularly if funds are tight. This is nothing short of miraculous considering their size but they really have to be heard, as the quality of sound that comes out of them is top notch. They are accurate, have a smooth and clear top end and detailed mids. Although the lows roll off at 60Hz (which isn't ideal for Dance music where low subs need to be heard), they can be paired with a CMS sub for extended low end response providing you with a very flexible and compact, yet full range monitoring setup. Bearing in mind their size and the applications they're aimed at, there's really nothing to fault. Once paired with the sub, we would be very happy mixing a whole album on them. They are surprisingly powerful and punchy and are easy to listen to over extended periods, but the main positive is that translation from studio to other systems is great and the character of the speakers remain consistent throughout the frequency range. Their response really is truly surprising for their size and you certainly won't be disappointed with their performance. If you need a compact setup and can compromise on the 60Hz roll, they're a great choice and you need to check them out. Focal have done it again.